It is the first day of Fall, or Equinox. Here in the Adirondacks it certainly feels like it. We had frost again last night and the foliage is almost at peak color and intensity. I had a beautiful roller ski yesterday afternoon and saw my first wooly bear caterpillar of the 08 season. 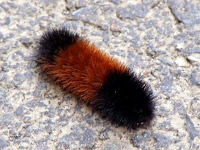 The wooly bear caterpillar is actually the larval stage of the Tiger Moth, but for my purposes they represent another weather prognosticator for the coming winter. Weather lore says you can predict the severity and length of the coming winter by studying the wooly bear caterpillar's stripes. I took advantage of the sighting yesterday to take a welcome rest and study some stripes. The specimen that caught my eye in Lake Placid yesterday had a large black stripe, a shortish brown section and then another larger black segment. Based on my scholarly research, it means we are going to have a nice, cold and snowy introduction to winter, followed by a few weeks of moderate temperatures in mid-January (and that's fine.) Then tons of snow in late winter to finish us off with skiing well into April. Buy your new skis. I have a good feeling about the results of yesterday's research. I've really been into science these days as you can tell from my recent black bear project coverage, so you can take this one to the bank. Or maybe just put it under your mattress these days. Either way, I predict another wonderful snowy winter of skiing in the Adirondacks!